Many people come to Exeter to track down information about their family in the Record Office. But they look for other things too - war memorials, for example, are sought out in the search for clues. But what many of those people forget is that Exeter now and Exeter when their ancestors lived here, are two totally different places. The town was bombed in the 2nd World War , and bombed by incendiaries - everything burned - our wills, our memorials, the books and records in our libraries, the churches and our homes. - it was all there when we went to bed one evening and next morning, by dawn's first light, it had all gone - everything - there was just smoking rubble everywhere. 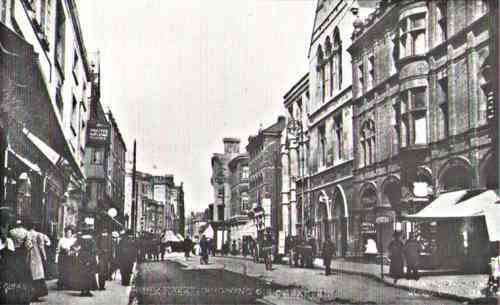 The worst of the destruction occurred in 1942 when the High Street was hit. Exeter had always taken pride in its civic buildings. The Council had invested in good architects who had provided buildings which were by no means avant garde but gave to the city a solid, respectable air and fitted well alongside the beautiful Tudor buildings which lined many of the streets. Everything in the photo below disappeared iin a single night as did almost all the people whose homes were above or behind the shops. . The General Post Office took pride of place in the High Street. It had been built between 1893 and 1895 on the site of the old Grammar School to designs in the Gothic style by London-based architect Edward Rivers. I have personal memories of this building (though not at this time!). It was the kind of place where even the grown-ups dropped their voices almost to a whisper when they went in - and was certainly a place that was awesome to a child. Except for the parcels department (which was in St David's station), all post office departments were housed here under the same roof and although there is not much detail in this picture you can just about see a couple of the small handcarts used by postmen , parked outside the building. The War Memorial which hung over the Telegraph counter, did not survive the bombing and the subsequent fire in May 1942 but fortunately we have a description of it and a record of the names. The description began with the words "In honoured memory of the men of the Exeter and District Post Office staff who fell in the Great War 1914 - 1918." It continued: "The tablet is of oak, fumed and waxed and is 4' 8" by 4' 4" and handsomely carved. The Royal Crown is set in the broken pediment at the top with the City Arms in high relief and picked out in colour beneath it. On the pilasters are two carved corbels of oak leaves and acorns, while across the bottom is carved a double spray of palm leaves with a flying dove holding an olive branch in its beak. The names are inscribed in raised letters and gilded and appear in the panel of the tablet.". 26466 Private Walter Charles Butler of the 2nd Battalion, the Devonshire Regiment. Son of Ellen Butler (widow). Born in Exeter in 1881. Died 16 August 1917 aged 36. 285759 Sergeant Ernest Full of the 14th Battalion, the Welsh Regiment; formerly 824, the Devonshire Regiment. Son of John and Edith Full of Heavitree. Born in Exeter in 1888. Died 8 October 1918 aged 30. 54314 Private Ephraim George Hambly of the Welsh Fusiliers; formerly 50907, the Welsh Regiment. Son of John and Fanny Hambly. Born in Parkham in 1890. Died 20 October 1918 aged 28. 10732 Private Albert John Hooper of the 8th Battalion, the Devonshire Regiment. Son of Mary Hooper (widow). Born in Dawlish in 1879. Died 25 September 1915 aged 36. He had been a postman in Dawlish. 182777 Sergeant James Edwin Kerswell of the Signal Squadron, the Royal Engineers. Son of Fanny Kerswell (widow). Born in Belderrig, Co. Sligo in 1879. Died 25 October 1918 aged 39. He had been a Post office Clerk in Dawlish. 290022 Sergeant Francis Percy Charles Mogridge of the 9th Battalion, the Devonshire Regiment. Son of Charles and Ellen Mogridge. Born in exeter in 1885. Died 26 October 1917 aged 32. 3128 Sapper Walter H. Moreman of the 3rd/1st Wessex Divisaion Signal Coy, the Royal Engineers. Son of Ernest and Bertha Moreman. Born in Watermore, Gloucestershire in 1888. Died at home 11 April 1916 aged 28. He had been a postman in Exeter studying for the Civil Service examination which would have got him a permanent position and eventually, a good pension. 33192 Private Horace C. Palmer of the 2nd Battalion, the Devonshire Regiment. Son of Alfred and Eliza Palmer. Born in Topsham in 1894. Died 22 September 1916 aged 22. Private Reginald Lawrence Short said to be of the Middlesex Regiment but not confirmed. Son of Lawrence and Lucy Short. Born in Exeter in the September Quarter of 1892. Date of death not known. 151829 Sapper Cecil Herbert Stallworthy of "F" Corps, HQ Signal Coy, the Royal Engineers. Son of Christopher and Constance Stallworhty; husband of Mabel Stallworthy. Born in Marylebone in 1886. Died 27 June 1918 aged 32. He had been a sorting clerk and telegraph messenger. 149060 Sapper Russell Lakeman Steer of "F" Cable section, the Royal Engineers. Son of James and Dorothy Steer. Born in Plymouth in 1896. Died 19 October 1916 aged 20. He had been a GPO Messenger. 128422 Gunner Ernest ("James") Charles Stone of the Royal Garrision Artillery; formerly 1850 of the Devonshire Artillery Garrison. Son of Charles and Sophia Stone. Born in Exeter in 1882. Died at home 2 December 1917 aged 35. 57530 Driver Joseph George Summers of the Royal Field Artillery. Husband of Jessie Summers of Exeter. Born in Honiton. Died 13 April 1915 aged 36. 21466 Sergeant Charles Telling of the 39th Division, the Signal Coy, the Royal Engineers. Son of Charles and Gertrude Telling. Born in Plymouth in 1893. Died 9 November 1917 aged 24. He had been a post office clerk in Exeter.